This is an update on a theme I raised in February 2016, “Donald Trump and the People” as I think the people see their existential threat more clearly now than they did seven months ago. In that article I tried to divide the political universe into two components, the roughly 20% who follow politics regularly via mainstream media, and those who don’t. But by comparison, over 80m people watched the Monday night debate, and if measured against the 127M people who voted in 2012, that would tell us that closer to 60% are paying attention now and we are still 3-4 weeks away from when media mavens tell us people “really start paying attention.”. That’s a powerful image and one few people even want to consider, as it reflects a reality most people associate with the early pre-war years of the German Reich or of Stalin’s decade-plus tearing down of the old order in Russia. Those sorts of images are still in Americans’ “unthinkable basket”. Still the images are real, not fairy tales. Having been to the old Soviet Union before its fall, and knowing people, regular people, all over the old Soviet empire, I have first hand knowledge of the empty shells of humanity the collapse of communism has left in its wake. Even the best, among them Poland, will take a generation to relocate all its guiding stars, while Russia, without a counter-counter revolution, may never find even one.. So yes, to me, the Flight 93 metaphor is a reality I’ve known up-close. But here, today, it is still only a warning, as if to say, that plane is out there on the tarmac, fully fueled and ready for take-off, the crew of assassins waiting for boarders,…so DON’T BUY THAT TICKET. PDM argues, and to my mind, convincingly, that this election may be our last chance to shut and lock the boarding gate before that happens..
Aside from the dedicated Trump supporters I still talk to a lot of wage-and hour-people, $8-$14, and an awful lot of retired professionals (engineers, stock brokers) among them quite a few Indians (first generation) who really have unique perspectives on the whole ideal “to be American”. I seek these people out. If we have “undecided” pro-American voters, these are them. And all of them consider themselves “haves” in the sense of good jobs or a secure retirement, and, except for the changes in their lives, and the lives of their adult children because of Obamacare, do not sense a looming, imminent threat arising from this election. It’s just a choice between a greater and lesser evil. And to choose which is which. In most cases they over-magnify the evil of Trump, inasmuch as he is much easier to spin “celebrity” gossip about, and minimize the evil of Hillary in the sense that her sins are political, and therefore easy to classify as ordinary in the average citizen’s mind. She’s a liar, but what politician isn’t? She’s a grasping, corrupt pay-for-play politician, but aren’t all politicians? Most really know very little about the magnitude of her crimes, her email scandal or the fact that many nations have hacked sensitive national secrets, possibly causing the deaths of our assets over there. Or that she has blood on her hands, her fingerprints not only in Benghazi but also in Syria. Or her perjuries. Hillary is no ordinary political crook, skimming off a million here or a million there. They still consider her to be an ordinary, everyday run-of-the-mill member of America’s criminal political class, and remarkably, they consider Donald Trump to be one as well, even though he has never had a political moment in his life until this campaign. In this group of voters, the crime of drawing moral equivalencies between serious crimes and boorish behavior, perjuries and white lies, dead men versus offended women, can be found in every conversation, fostered by a media, often conservative media, witness the few conservatives who tried to debunk PDM’s Flight 93 metaphor, with “Hey, we can get along just fine under a Hillary regime, for there will always a next election that we will be able to fight our way back.” Actually, that highlighted “we” applied only to a select few of insiders, ignoring the fate of millions. Among these detached voters, this has actually been evident since the Clinton presidency, people today, sadly do not measure the damage done to their country except as how it affects them directly. They have not really noticed the plight of those destroyed by Obama, the millions who no longer have jobs to go to, but would like to. Those people are not in their orbit, they are invisible to them, and no one really goes out of his/her to make them aware….until Donald Trump. That’s right, Donald Trump. And to be honest, he makes many of them uncomfortable for being made to think of those things. Make America Great is a “we” slogan, just as it was in 1980 and Ronald Reagan, and putting the “we” back into American politics is a necessary first step for the recovering indifferent patriot. In short, many Americans feel, even as 20% have lost almost everything, the existential threat to them is Low. Now, Publius Decius Mus wrote his essay to persuade an entirely different audience, the so-called “smarter-than-thou conservatives” who stand at the center of the (diminishing) #NeverTrump cabal. It used to be a movement but I think PDM made a lot of headway among its less egotistical scholars, for even Ted Cruz has come over. What we know is that Trump-enthusiasm is seismic, an airborne phenomenon. And there is an existential element in that enthusiasm, as well there has to be, since from the other side, the Left, this election is also existential. They can see 25-50 years of planning, hard work and execution going up in smoke in a very short period of time should they lose. Worse, they can see another hand reaching up to turn the heat control switch to OFF where they had been slowly boiling to death the nation. Just in time. In the final analysis, the People are the repositors of true conservatism in American, and have been from the beginning. It will be for new conservative minds to re-frame conservatism around what the people have determined. I assure you Burke and the Founders will not be omitted. Also, rest assured the people will not be entirely correct. After all, we are an ordinary lot. So it will require a new generation of preachers, teachers and missionaries, instead of the fat, sassy scolds we seem to have inherited, to reintroduce and edify, even cajole, the people, rather than mock and stomp feet at them. For you see, Donald Trump might embolden the people, but he cannot weed out that den of vipers who run our schools, K-thru-MBA/JD/PhD, or our local governments. As it was in the beginning, the government’s true purpose will be to keep the barbarians outside our gates, and away from our own self-made religious and social institutions. If we cannot or will not undertake to do that as a collective society, with the four-corners of the original Constitutional blueprint, then even the best of governments will eventually fail. 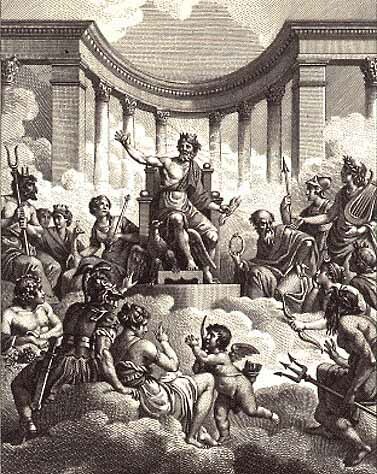 Like gods on Olympus, you will have to remember your place, as protectors of the people while they go about regaining their moral and civil culture, for without it they will surely die, Constitution or no Constitution.